Customized Video Packages perfect for all Weddings! 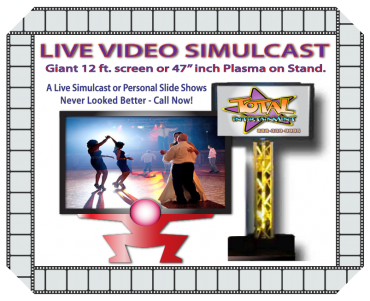 A Variety of HD Video Packages along with a Live Simulcast! We offer the best selection of Video Packages in New England. Filming starts 1/2 hour prior to wedding ceremony or reception & includes guest arrivals, bridal party arrival, coverage of your formal photographers poses, and departure from church, temple or JP and arrival at reception. DVD’s are professionally mastered with menus, photo galleries and chapters for easy access to your favorite moments. All DVD’s are personalized with music and photos you provide. Professional editing by experienced TV Producer of one or two camera footage into a finished length of between 1 to 4 hours (length depends on the package chosen). A five to six minute music montage (using music you provide) showing your reception highlights. Photo gallery (with music you provide) of your formal photographs. Finished DVD packaged in a personalized leather keepsake case. All day coverage (includes any prep at house until the end of the reception when the band or DJ leave) with 2 Cameras. Photo collage added to your DVD (up to 99 photos). Professional edit of your formal photographers photos added to our video footage in a spectacular music montage. guest video interviews (well wishers etc). live footage simulcast on (2) 9ft x 6ft screens during reception. 5 finished DVD/VHS packaged in a personalized leather keepsake cases and up to 4 hours of your celebration edited from 2 cameras angles packed in a double DVD case. Complete coverage of your reception (until the band/DJ leaves) with 2 cameras. Photo gallery of your formal photographs (up to 99 photos) with background music you provide. live footage simulcast on 9ft x 6ft screen during reception. Up to 3 hours of your party edited from 2 cameras angles packed in a double DVD case. 3 finished DVD/VHS packaged in a personalized keepsake case. Photo gallery of your formal photographs (up to 50 photos) with background music you provide. Up to 2 hours of your party edited and packed in a DVD case. 2 finished DVD/VHS packaged in a personalized keepsake case. Complete coverage of your reception (until the band/DJ leaves) with 1 camera. Up to 2 hours of your wedding edited and packed in a DVD case. 2 finished DVD/VHS packaged in a personalized keepsake case. we receive all photos & music from you. Additional non packaged (DVD in plastic CD case with label) are available @ $5.00 per copy. Additional packed DVD’s are $30.00 per copy. All raw footage can be transferred to DVD (no menu) for a fee of $20.00 per hour of raw footage. Don’t forget to check out our Photography and DJ Services.